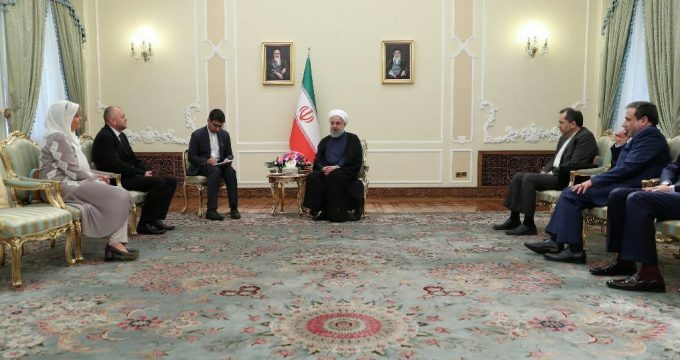 president.ir – Speaking on Tuesday in a meeting with the new Ambassador of Bosnia and Herzegovina to Tehran, President Hassan Rouhani said, “Development of relations and ties with Bosnia and Herzegovina in different fields is very important for Iran”. “Tehran is ready to deepen its political, commercial, economic and cultural ties with Sarajevo,” he continued. Dr Rouhani also went on to refer to the historical, amicable relations between the two nations and said, “The Islamic Republic of Iran has always stood by the people of Bosnia and Herzegovina in hard times”. “Today, we are happy that this country is enjoying peace and security with all ethnic groups living alongside each other,” continued Rouhani. He added, “All existing potentials and capabilities in the two countries should be taken advantage of to further deepen Tehran-Sarajevo relations”. New Ambassador of Bosnia and Herzegovina to Tehran presented his letter of credence to the President and said that his country was determined to develop relations with the Islamic Republic of Iran in all fields of mutual interest, especially economy”.